We have fog and rain this early morning as we say goodbye to Juneau and enter Gastineau Channel. With the crazy extreme tides we are leaving on a high tide at five AM so to be sure we can get out of the marina with plenty of water under the keel. 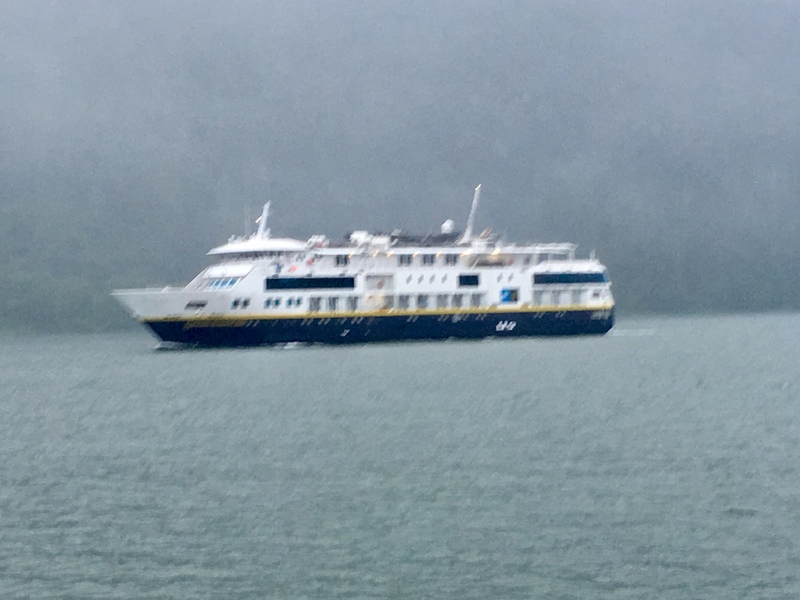 The Nat Geo Quest is heading up the channel to Juneau ending a week of sightseeing for its many cruise ship passengers. The cruise ship Coral Princess with their thousands of passengers aboard is soon also slipping past us in the narrow channel. We have a nice calm passage through Stevens Channel and into Saginaw Channel. 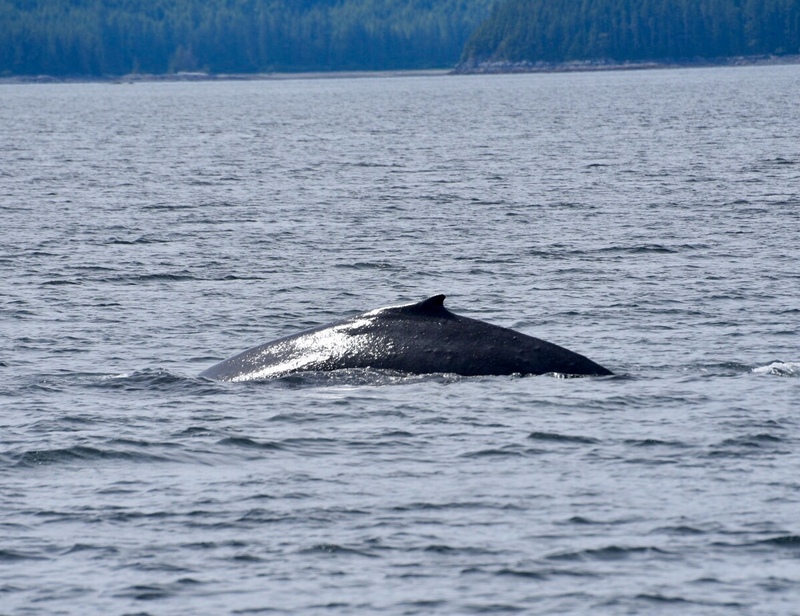 We spot one humpback feeding as he crosses our bow. Rounding Pt. 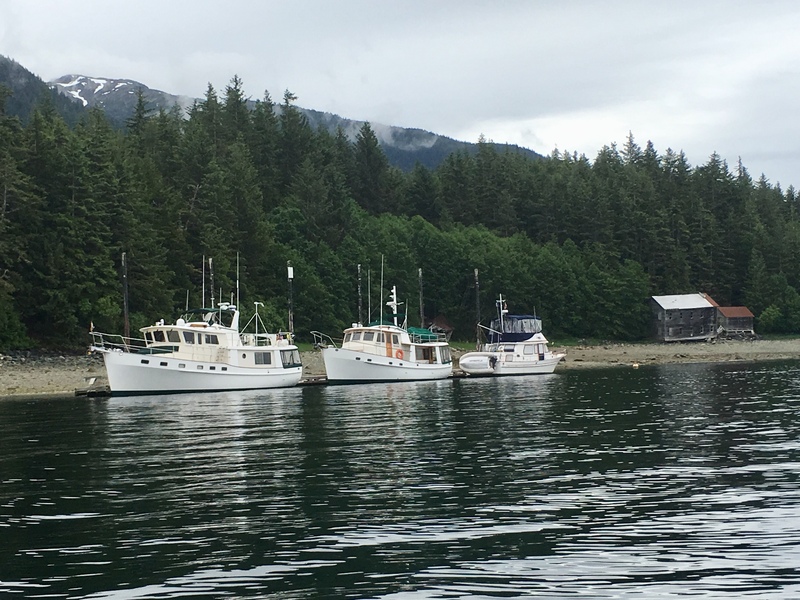 Retreat and entering the Lynn Canal, conditions change dramatically. We now have three to four foot seas on about a four second period on our bow with 15 to 20 knot gusts. Luckily we only have twelve miles to our anchorage. The wind and tide are opposing each other creating a lumpy sea. 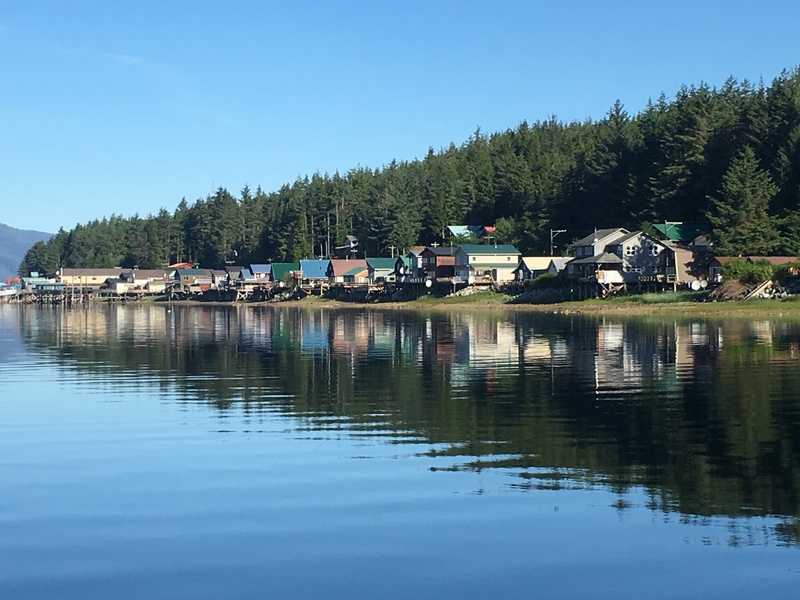 The calm protected waters of Funter Bay on Admiralty Island are a welcome sight. We see only one boat on the free float located along the southern side of the anchorage. This state funded dock is not connected to land, just a secure place to tie instead of anchoring. Quite a few bays here in Alaska offer free floats for boaters use, a nice luxury. We are greeted by Jene on Adventure as he takes our lines. Rekindle soon takes the last spot on the float. After setting the crab traps, we head over to the community dock for some land exploration. Several vacation cabins connected by boardwalks now occupy an old cannery site. 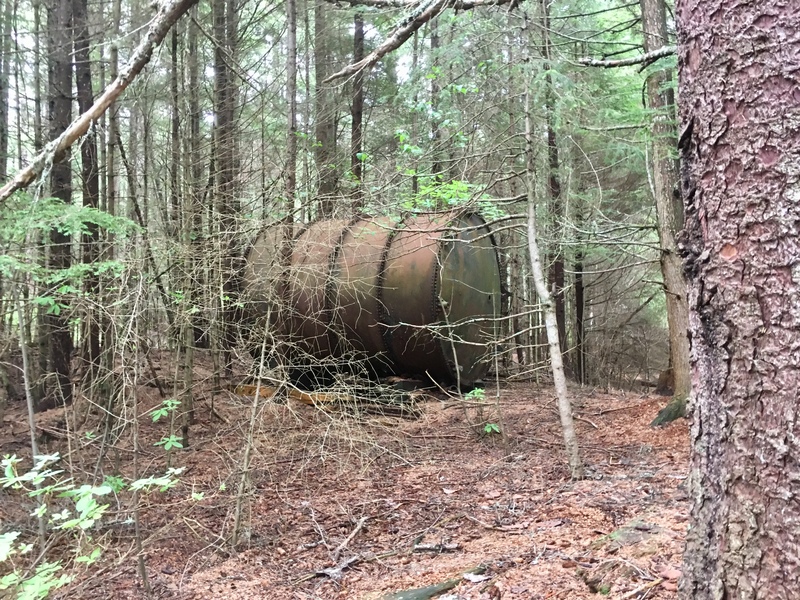 Pieces of machinery are still visible in the woods between these homes. Further down the beach, a white cross marks the trail to a small Aleutian grave site. We hike through a dark tunnel of tall hemlock and spruce trees keeping our eyes peeled for wandering grizzly bears. It is somewhat comforting to know we have our bear spray and shotgun with us for protection. 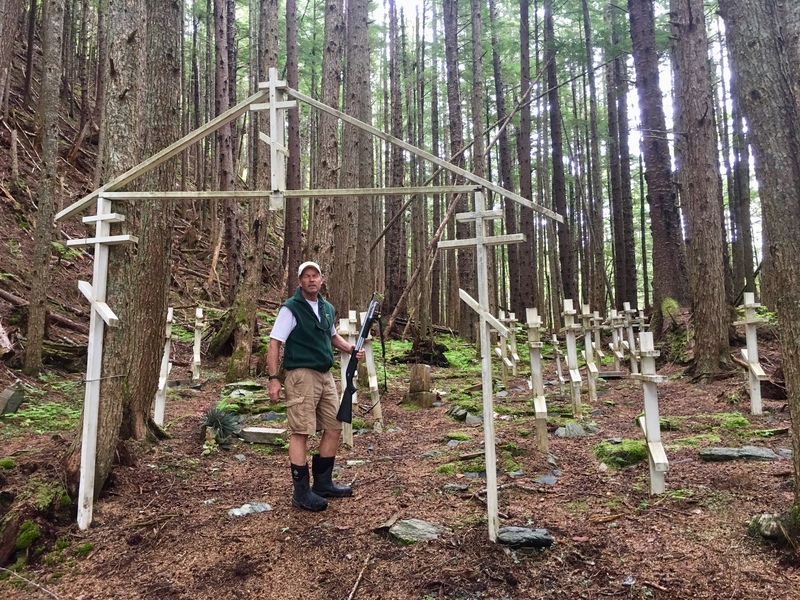 The trail leads to a white wooden archway behind which are rows of white Russian Orthodox crosses. 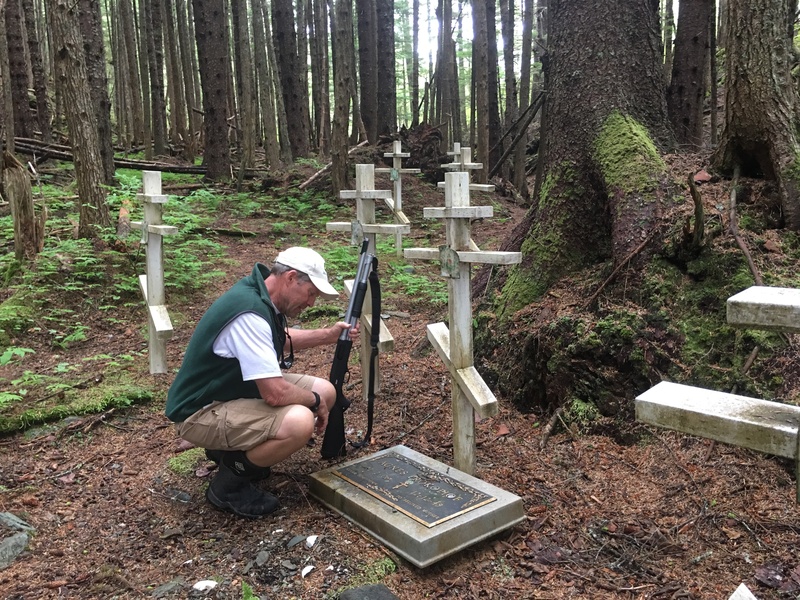 The graves are of some of the many Aleuts who died after being removed from their ancestral homes during WWII. Funter Bay became a refuge camp for some of the 881 Alutes evacuated during the threat of Japanese evasion. Many of the refugees died due to poor sanitary conditions and inadequate housing. In a two year period, 32 died here on Funter Bay. It is a little eerie walking around these well maintained graves. We wonder who takes care of this sacred site. We haul the crab traps this evening and collect our six crab limit. Several more in the trap are returned to the bay. Our day starts off with a wonderful surprise. We are up at five AM to cast off our lines and say our goodbyes to Jene on Adventure. We make a comment about wanting to get another rod holder so we can fish from the pilot house while underway. Jene quickly disappears and soon returns with a beautiful stainless rod holder. He insists we take it as a gift since he is no longer using it. What an incredible gesture from someone we just met yesterday. We hope that our paths cross again so that we can repay this kindness. As we enter Lynn Canal, we find ourselves amongst a pod of Orcas feeding. These whales are not nearly as shy as the humpbacks but are fast moving. It is hard to tell where they will surface next. Seeing them work together is amazing. Leaving the feeding frenzy behind, we enter the junction of Icy Strait and Chatham Sound only to be engulfed by a fog bank. 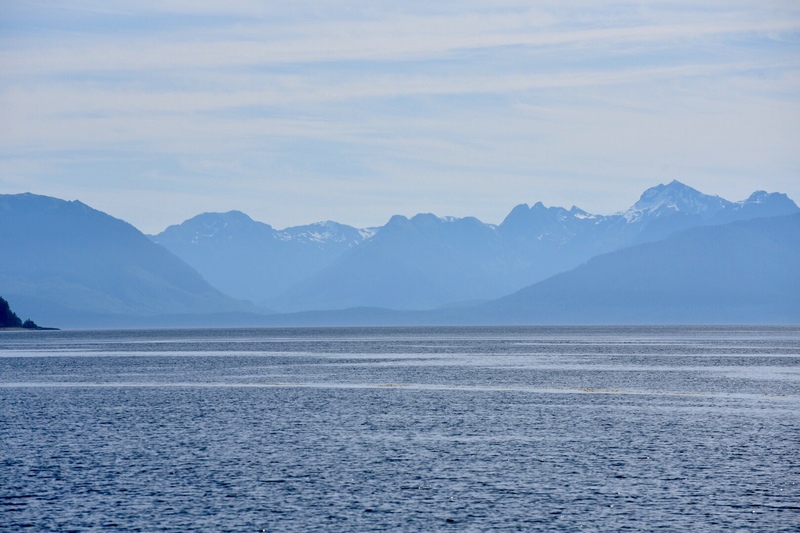 Once in Chatham Sound the fog dissipates and we are treated to a cloudless day with stunning mountains in the distance. The wonderfully funky little town of Tenakee Springs on Chichagof Island is our stop for the evening. As we approach the marina, we can see rows of small colorful cottages perched on stilts along the shoreline. 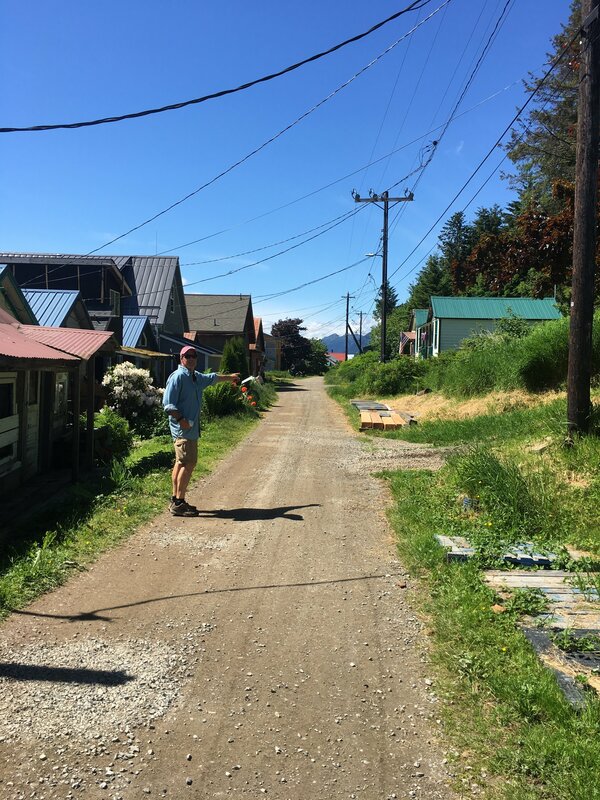 After taking a spot on the floating dock, we walk ¼ mile into town along a dirt and gravel cart path. This is the only road in Tenakee and there are no cars just a few ATV’s and bicycles. Our first stop is the Part Time Bakery. Their homemade cinnamon rolls made fresh daily are legendary. We put an order in for a half dozen to pickup tomorrow morning. 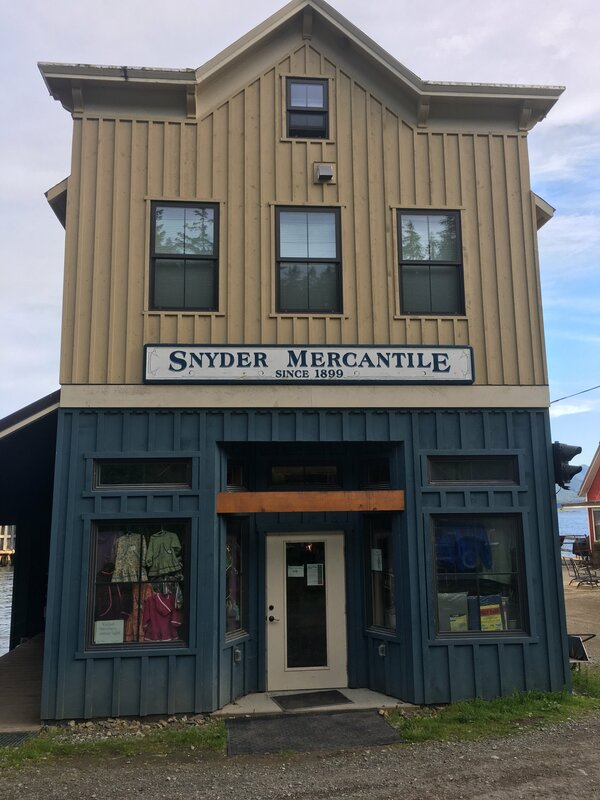 Wandering further down the path, our next stop is Snyder Mercantile, the only store here in Tenakee. 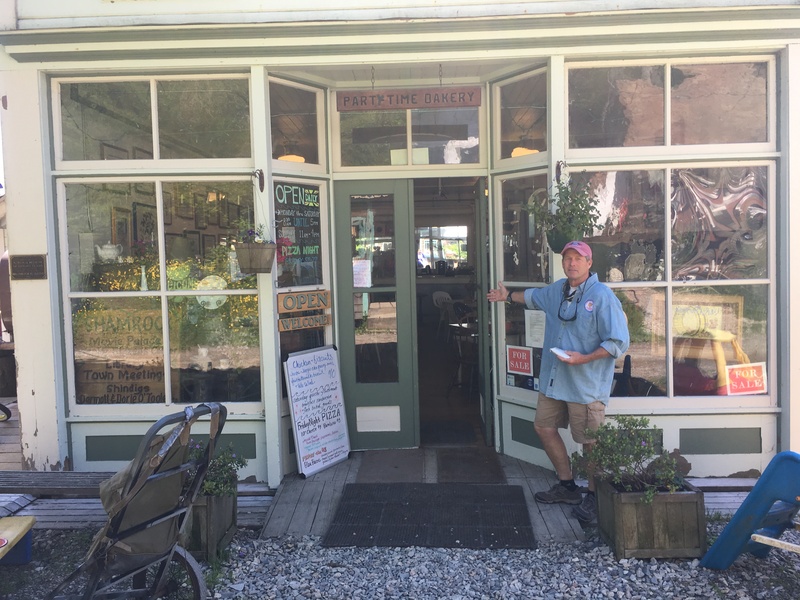 It has been in operation since 1899 and it’s clean and well stocked shelves have nearly everything an island community would need. Directly across from the store we find the hot sulfur springs bathhouse. It is the heart of the Tenakee community. Above the door,hours are posted for men and women alternating in four hour segments. Clothing is NOT allowed. Strict rules concerning pre soak cleaning are also posted. 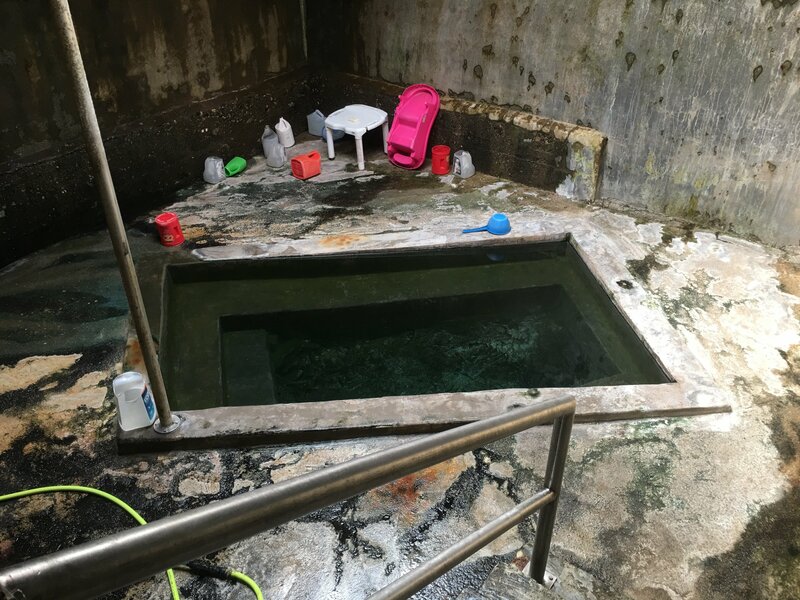 The springs are used by many of the residents for bathing as most homes have no running water. We chat with several local residents we see along the path. Tenakee is home to approximately forty year round residents. The population grows to about one hundred during the summer. The local school grades k thru 12 only operates with twelve or more students. Since there are only five school age children now in the village, parents are currently homeschooling. Seaplane service from Juneau operates three times daily. The Alaska ferry also makes weekly stops. There is a small post office and the library and town offices occupy the top floor of the community center. They generate their own power and are quite an independent fishing community. Tenakee is our kind of place. This entry was posted on July 12, 2018 at 11:54 pm. You can follow any responses to this entry through the RSS 2.0 feed. You can leave a response, or trackback from your own site.